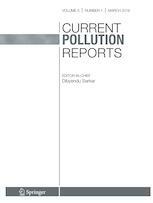 Current Pollution Reports provides in-depth review articles contributed by international experts on the most significant developments in the field of environmental pollution. Submissions are sought via invitations, however, relevant, high quality voluntary contributions are considered as well on a case-by-case basis upon approval of the Editor-in-Chief. By presenting clear, insightful, balanced reviews that emphasize recently published papers of major importance, the journal elucidates current and emerging approaches to identification, characterization, treatment, management of pollutants and much more. Arsenic in Drinking Water: Is 10 μg/L a Safe Limit?